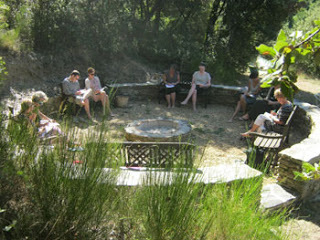 Groupwork for adults: day workshops, weekend and week-long residential retreats and courses currently in creative and reflective writing, in poetry, the novel, Zen and poetry, in writing for in psychospirituality, for therapy and personal growth, in exploration of ecosoul work (‘Horse Medicine’, or ‘Tongues in Trees’, for instance), and in the service of deep ecology. They take place on Exmoor and Dartmoor, in Cornwall, the Hebrides, Brittany and France. Click here for the calendar for 2018/9. Online courses STORYMAKING: writing the novel; ELEMENTS OF POETRY; THRESHOLDS; and new for the end of 2018 and all through 2019 TONGUES in TREES. When I have the time to design them, these will be followed by my intensive Wild Ways eco-soul course; Wellkeepers; and an Introduction to Poetry. Workshops for schools (& INSET days for teachers) drawing together creative writing, environmental awareness and emotional intelligence, often wholly or partly outdoors (I’ve been offering all my groupwork, adult and student, for 27+ years).